There have been two recent and important developments in the area of train control systems, the safety systems known in U.S. parlance as "Positive Train Control" or PTC. Both of them have a direct impact on the future of the peninsula rail corridor. Caltrain's CBOSS project, criticized for years on this blog, is in ever deeper trouble. According to Caltrain's latest project update, the $231 million previously allocated for this project are nearly spent, but the project is way behind schedule and struggling in the most perilous and delay-prone phase of all: testing of the integrated system. Testing is where it all finally comes together, not in the carefully controlled environment of a lab test bench, but in the real world with all its ugly imperfections, annoying glitches, and external influences. 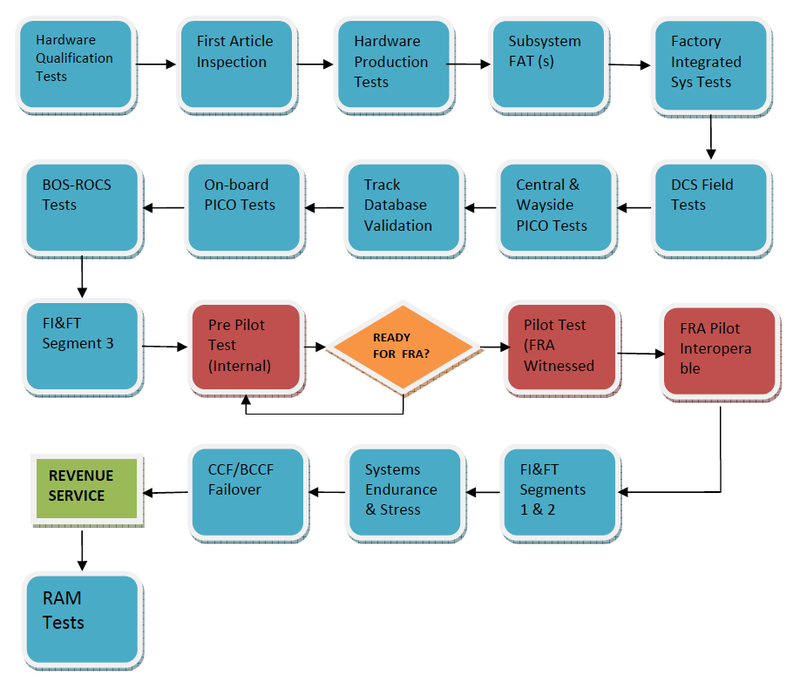 In each segment of the railroad, three things have to happen in sequence: (1) everything has to be fiddled with until it works; (2) when everything works, a dry-run of the official acceptance test, known as "Pilot Testing," is performed; and (3) the system is formally accepted after passing the official FRA-witnessed test of all its functions. Caltrain's project is stuck in the "fiddle with it until it works" phase, helpfully diagrammed as an infinite loop in the test flow diagram at right, extracted from a CBOSS Verification, Testing and Inspection Plan filed with the FRA. This is where the schedule and budget are blowing up, with Caltrain's next step described as "Complete Segment #3 Pilot Testing and FRA Witness Testing," coming as soon as they are "Ready for FRA," whenever that may actually be. Caltrain's update mentions "software release delays" relating to the I-ITCS product that CBOSS is based on. There are worrying signs that I-ITCS may become a technological dead end: the company that makes it, GE Signalling, was recently acquired by French rail giant Alstom. Alstom's mainline signaling product portfolio does not give it top billing. Furthermore, the FRA process is described as being "in flux", meaning that the goal posts are moving. What we have here is a classic foundering IT project, and it isn't clear if throwing more money at it (at a burn rate of about $50M/year) is going to save it. With the federal PTC implementation deadline now pushed out to 2018, this is a good time to stop and re-assess the project before escalating the commitment. Meanwhile, the California HSR Authority is about to spend $50 million to secure the rights to a key chunk of radio frequency spectrum. The frequency bands being purchased are 757-758 MHz and 787-788 MHz, not the usual 220 MHz band used for freight PTC systems. Instead, the CHSRA has documented its intent to deploy ERTMS, an increasingly mature and proven train control standard that originated in Europe and is increasingly in worldwide use. The two bands purchased for HSR are not sufficiently wide to deploy GSM-R, the obsolescent communications standard currently used as part of ERTMS. 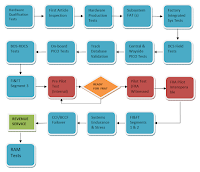 It is more likely that California's deployment of ERTMS will use a more modern, secure and spectrum-efficient LTE communications layer, following the evolutionary path beyond GSM-R already being planned for ERTMS. Then an opportunity exists to deploy a train control pilot project on the peninsula rail corridor, using ERTMS with LTE communications in the 700 MHz band. This scenario recognizes an important fact so far disregarded by Caltrain, that HSR will become by far the largest tenant railroad on the peninsula. Ignoring this fact is an odd position to take for a railroad that hangs its future on "blending" with HSR. Caltrain will surely dislike the idea, bleating about closer headways, crossing signal integration, station stop enforcement and other completely unproven bells and whistles--as they have since 2009--but events are now quite clearly bearing out the relative technological merits of ERTMS and CBOSS. It's just sad that it took a quarter of a billion dollars to settle the question. In the unforgiving world of system integration testing, reality always wins.